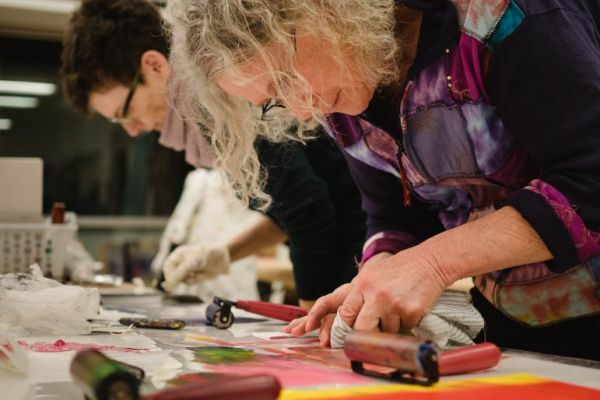 This three-part class led by Brian Hoad incorporates multiple strategies for creating fine art prints at home and in the studio with a focus on relief printing. The class will review printing basics, carve two linoleum blocks, also called “linocuts,” and print them on greeting cards, t-shirts, and paper. Participants will draw directly on linoleum blocks (a synthetic, soft material that is easily cut) or transfer computerized images with ease. A variety of other inkable materials will be available for the class to layer with their carvings. Beginners are welcome. Come out and discover the magic of printmaking. Brian Hoad (b.1992) is a visual artist originally from Port Hope, ON. He received his Bachelor of Fine Art Honours, Visual Art in 2015 from Queen’s University and Master of Fine Art, Visual Art in 2017 from the University of Regina. He maintains a studio practice at Dead On Collective in Kingston, ON, where he works as the Technician Supervisor and Painting & Drawing Technician for the Fine Art (Visual Art) Program at Queen’s University. Recent exhibitions include lim∙i∙nal, An exhibition of North American Printmaking (2019 Hague Gallery, Regina SK), Remixing Environments (2018 Blizzmax, Picton ON), and me you & a few of our friends, featuring works by printmakers from the US, Canada, and the UK (2018 The Galleries at Georgetown College, Georgetown KY USA).